Congratulations to the Duquesne University Mylan School of Pharmacy American Society of Health-System Pharmacists Student Society of Health-System Pharmacists (ASHP-SSHP) chapter on winning the Outstanding Professional Development Project Award at the 50th Annual ASHP Midyear Clinical Meeting in New Orleans, La. last weekend. 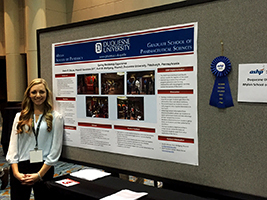 At the conference, chapter president and PYIII Alexis DeLeo presented a poster on the annual "Spring Residency Experience" program organized by the group every Spring semester. "The content, creativity, impact and overall impression of [the Duquesne University Mylan School of Pharmacy's] project exceed that of other applicants," ASHP spokesperson Diana Dabdub said in a press release. "Being a recipient of this award is a distinguished honor and we are excited to recognize your project's poster at the Student Society Showcase and Awards Ceremony." Dr. Kurt Wolfgang, Assistant Professor of Pharmacy Practice, serves as adviser for the group.